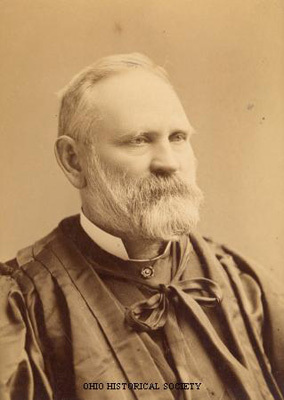 Stanley Matthews (1824-1889) was justice of the U.S. Supreme Court from 1881 to 1889. Stanley Matthews was born on July 21, 1824, in Cincinnati, Ohio. He attended public schools in Cincinnati, before enrolling in Kenyon College. Matthews graduated from Kenyon in 1840 and began to study the law. In 1842, he opened a legal practice in Maury County, Tennessee, but Matthews returned to Cincinnati by 1844, where he established a new practice. Matthews's reputation grew quickly, and he was honored with numerous appointments and election victories. He became the prosecuting attorney of Hamilton County, Ohio, in 1845. From 1848 to 1850, Matthews served as a clerk in the Ohio House of Representatives. In 1850, he became a judge on Hamilton County's Court of Common Pleas, a position that he held for two years. In 1856, he secured a seat in the Ohio Senate. President James Buchanan appointed Matthews as a United States District Attorney for Southern Ohio in 1858. In 1861, Matthews resigned as district attorney to serve in the United States Army during the American Civil War. He rose to the rank of colonel before resigning his commission in 1863. Matthews briefly served as a judge on the Cincinnati Superior Court, before resuming his legal practice in Cincinnati. Matthews did not stay out of public service for long. He served as one of the Republican Party's presidential electors in 1864 and 1868. In 1876, Matthews unsuccessfully ran for the United States House of Representatives. The following year, he served as legal counsel to the government officials who brokered the Compromise of 1877. In 1877, the Ohio legislature selected Matthews to complete John Sherman's term in the United States Senate. He did not seek a reappointment when the term expired in 1879. In 1881, President Rutherford B. Hayes, an Ohioan, nominated Matthews to a seat on the United States Supreme Court. The Senate failed to act on the nomination. Hayes's successor, James Garfield, another Ohioan, re-nominated Matthews for the justice position. This time, the United States Senate approved the nomination. Matthews served on the United States Supreme Court until his death on March 22, 1889.